When shopping this spring for new styles and looks, certainly, taking a green stand by supporting eco-fashion and conscientious designers is essential. What of your canine's couture? Has your hound gone as green as he can go? From organic and natural foods, to eco-friendly items to adorn both ourselves and our homes, to natural cleaning products, greener choices are all around us. Green products for pets are making a splash, challenging pet owners to reconsider their choices. "Being green is natural for me," says Rex the Lab of Rex Reviews. "Beyond my daily 'chemical free' contributions to keeping my yard fresh and green, upcycling is one of my favorite hobbies. What may look like a smelly, old shoe to some is a thing of beauty to me. A bit of skilled gnawing and sculpting can turn it into a work of art!" Rex was quite happy to have been offered an opportunity to explore the stylish, green line of dog essentials from Dutch Dog Amsterdam. This Mom realized, with chagrin, we had overlooked this basic area of opportunity to reduce our carbon paw print. Rex simply treated me to one of "those looks". "My style is minimalist,"says Rex. "Even so, I like the few items I sport to make a statement about me as a conscientious canine, reflecting both my passion for green efforts, as well my love of the finer things. A savvy pooch can have both!" 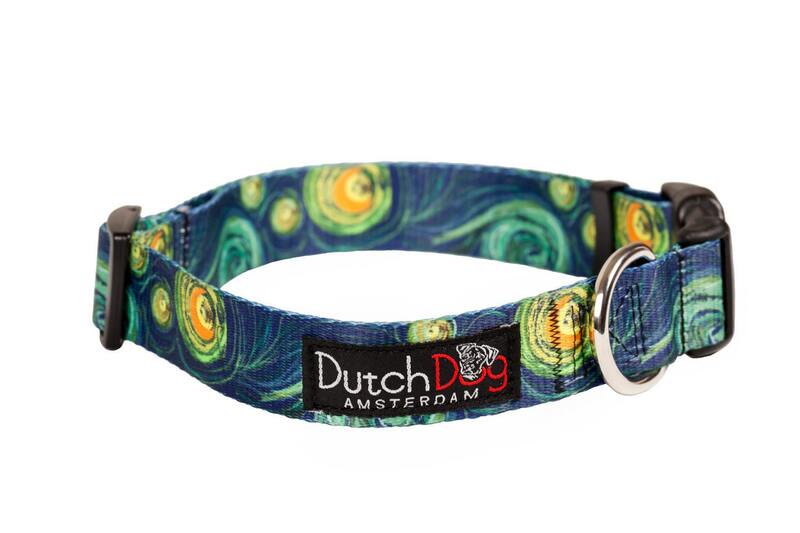 Although Rex was challenged to select from the stunning designs in eco collars and leads offered by Dutch Dog Amsterdam, this Mom was certainly not surprised by his choice, inspired by Van Gogh's Starry Night. It's really quite striking against his flaxen fur, making a strong statement as he travels and greets guests, about his inner dog. Made with PET recycled webbing and non-toxic materials, this Mom feels good about choosing Dutch Dog Amsterdam essentials; safe for my furry boy, safe for the Earth. At first glance, finding the material a bit lighter, less dense than Rex's current webbed collar, I was a bit concerned. Our boy likes his walks at quite a brisk pace. After a three week testing period, including daily walks and several trips to the dog park, this Mom is happy to report that the Dutch Dog collar and lead proved sturdy and reliable. Although Rex is an active, fit Labrador, his neck is quite large. After taking measurements of his current collar, one which he had nearly outgrown, I was a bit skeptical regarding the fit of the largest option from Dutch Dog Amsterdam. The Large length was the same as Rex's current collar. Again, I was pleasantly surprised. 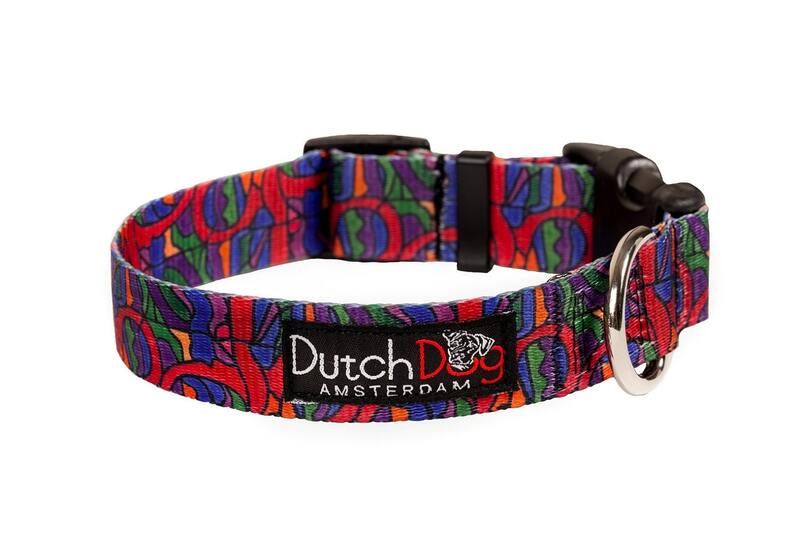 Not only do the Dutch Dog collars connect with an easy snapping device, as opposed to metal buckle we've been accustomed to, the collars are adjustable! The Large size fit Rex beautifully, with ample room for expansion to accommodate his cowl! With three classic, inspired looks, you are certain to find an eco-friendly choice to suit both your style, as well as your style hound! Dutch Dog Amsterdam essentials can be purchased at select retailers in the United States, Nederland, as well as via their Etsy store. Green, durable and surprisingly affordable, both Rex and this Mom strongly recommends exploration! 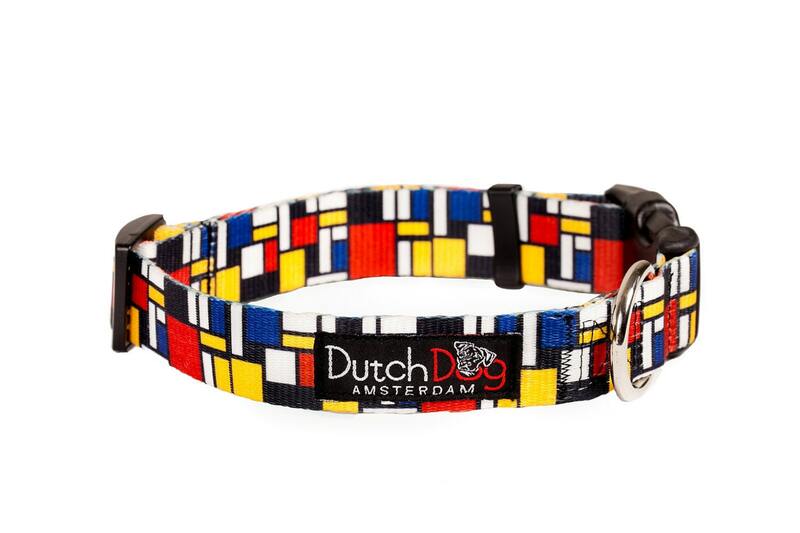 Dutch Dog Amsterdam is generously offering That's What She Said readers a chance to win a Mondrian collar and lead set! This giveaway is open to residents of the United States, 18+ and will end on Wednesday, May 2nd, 2012 at 12:01am EST. I was provided with a Van Gogh inspired collar and lead set to explore for the purposes of creating this feature. The opinions and experiences above are both honest and my own. Some images and information sourced from various Dutch Dog sites. Sponsor is responsible for providing and shipping the prize. Facebook, Pinterest and Google+ are not involved in, nor responsible for this giveaway in any fashion. 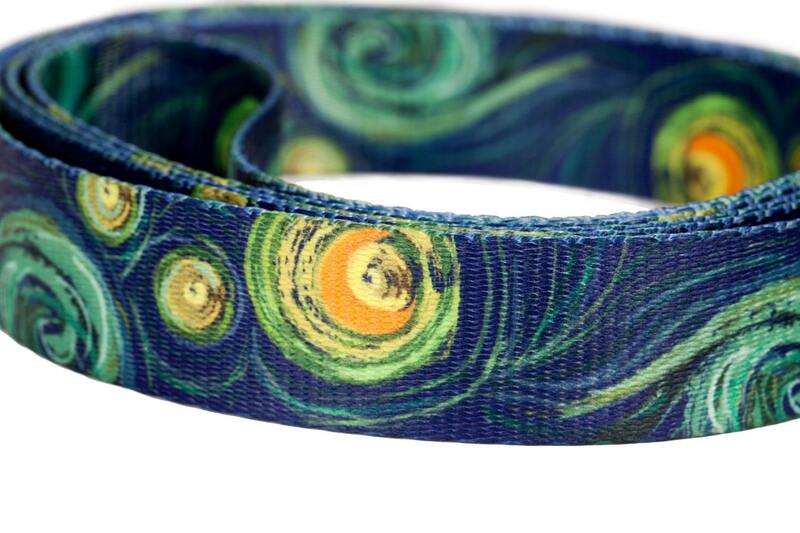 I would like the Van gogh dog leash. I like that if my dog chews on his leash, no harm is done. I learned that my dog’s health and well-being is their first concern. Furthermore, the PET materials allows for the dog leashes and collars to be soft and comfortable against a dog’s body, yet strong. I love that they are green. The Heemskerck is really nice. I learned that they use designs from famous artists and that their materials are non-toxic. Great for me and Dumpling! So cute. Now our pets can be greet too. I like the Van Gogh. I learned i can only buy these products online for my area. That it is made out of non-toxic recyclables excites me. I learned that Dutch Dog Design LLC has introduced an innovative product line of dog beds, also. 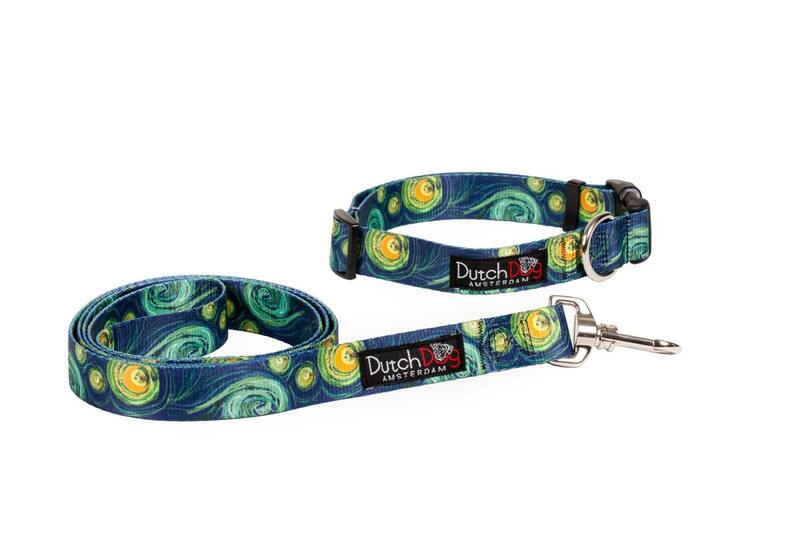 I love the Van Gogh leash and collar! Their products are available online. The words NonToxic caught my eye. I would feel better knowing that if my dog walked around with the leash in her mouth, she's safe. I learned that I can only get them online. There are no places to buy this near me. I like their snooze beds also! Nice items. The Mondrian collar is different than anything I've ever seen. It would fit Jackpot's personality. He is, after all, a schnoodle. I like the Dog Leash van Heemskerck because it is so pretty! I'd like the VanGogh Inspiration lease....because we can always use an extra leash around! There are no dealers within a 250 mile area of me, so I would have to buy online. Christina - I learned that the collars are soft and comfortable, yet strong. I like that they are supposed to be very comfortable. I would love this for my Precious! I love the material. I love that the the collars are soft and comfortable against the dog's body.